Conducting photo workshops allows me to observe hundreds of other photographers each year. It’s clear that each brings his or her own personality to the act of creating an image, from the way they search for compositions, to the things they notice (and don’t notice). I could go on and on about any of these differences, but today’s image really underscores a particular aspect of my approach, so (since this is my blog) I thought I’d write about that. work the composition to with in an inch of its life. Many charitably label me “patient,” though often it feels more like stubbornness: “I’m not leaving here until I get exactly what I want.” Whatever you call it, this approach works for me because careful observation and measured response is the way I relate to the world. I’ve observed that other, more spontaneous, photographers are very frenetic in the field, constantly moving and exploring, rarely dallying at one spot at risk of missing something special elsewhere. These photographers expose themselves to more opportunities, capturing far more variety on any given shoot, than I do. While I believe it’s important to observe other photographers and borrow from them when something resonates, ultimate success comes from being true to your own instincts and inclinations. Just as I wouldn’t do well rushing from spot to spot, a more kinetic photographer might go crazy wasting time on one shot when there’s so much other great stuff nearby. 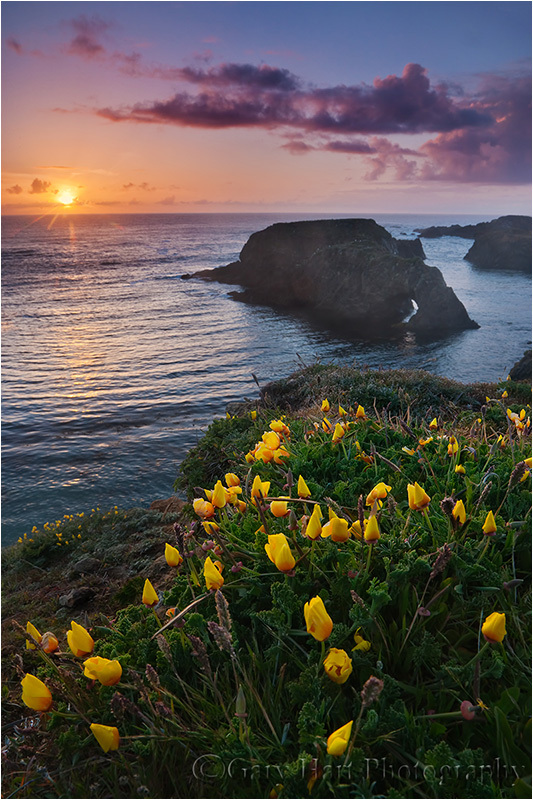 On the penultimate evening of Don Smith’s Northern California workshop, Don and I landed our group on the Mendocino Headlands about ninety minutes before sunset. Scanning for elements to assemble into a composition, the first thing that caught my attention were the colorful wildflowers dotting the cliffs. The cove and ocean beyond was clearly photo-worthy (though an assortment of large rocks in the water would need to be handled with care to avoid introducing distractions or disturbing the frame’s balance). On the horizon bloomed billowing cumulus, vestiges of the day’s rain. The sun was still fairly high, an initial hindrance that could potentially become an opportunity if the clouds cooperated as sunset approached. All I needed to make an image was a focal point, a compelling subject to anchor my frame. My eyes immediately darted to a patch of poppies overlooking the Pacific, as if waiting with the rest of us for the sun to set. Though they’d closed for the day, I just couldn’t resist the color and grace of my favorite flower. Once I identified the elements for my frame, I still had to assemble them into an image and immediately dropped to the ground to exaggerate the poppies and minimize a less appealing patch of weeds behind them. A vertical composition allowed me to fill the entire bottom of the frame with poppies while including a lot of sure-to-be-dramatic sky. Anticipating the position of the sun’s exit, I used the diagonal cliff edge to point at the island and create a virtual triangle (poppies, island, sun) for balance. With everything positioned in my frame, I was pretty sure I’d found my shot, but still had an hour to kill before sunset. No problem–I confidently locked-in the composition on my tripod and rose to check on the rest of the group. Several were set up within a few feet of me; others were distributed up and down the headlands. All were most pleased with the scene and potential for more. As I moved among the other workshop photographers, I kept my eyes open for other compositions. Singular focus is great, but experience (i.e., a few frustrating misses) has taught me not to be so locked on a subject that I become blind to other great stuff such as changing light or an even better composition I might have missed. Convinced that I’d made the best choice (for me) that evening, I returned to my camera to wait. But even the act of waiting is far from static. First I made sure my polarizer was oriented properly and readied my graduated neutral density filters. Next, I started the exposure process by identifying the scene’s variables. Knowing first and foremost the foreground poppies must be sharp, I chose f16 for the best combination of depth of field and lens sharpness (to avoid diffraction and soft corners, I try to avoid going smaller than f16). I focused midway through the foreground poppies, confident that, at my chosen 28mm focal length, f16 would ensure complete sharpness in the poppies and acceptable sharpness in the background. But the small aperture also meant a one second exposure at my preferred ISO 100; while the breeze was light, I felt much more comfortable at ISO 400 and 1/4 second. With all this worked out, I was able to spend the rest of my waiting time monitoring the waves and tweaking my composition. There wasn’t a lot going on in the surf, but I soon realized that the small arch in the middle-right stood out best as a wave washed through. The other dynamic issue was distracting white surf that appeared when waves struck a rock just outside the frame on the left. And I’d initially overlooked a small patch of poppies on the bluff, beyond my foreground patch, but soon appreciated that this bunch nicely filled an otherwise blank space if I took care to avoid trimming it with the frame’s border. By the time the sun dropped to the horizon and the clouds started to light up, I was so familiar with everything in my scene that slight composition adjustments to account for the rapidly moving clouds were easily handled without impacting the factors I’d identified earlier (surf, background poppy patch, focus point, potential wind motion, and so on). This familiarity also enabled me to occasionally recompose wider, tighter, or horizontal then quickly return to my primary (this) composition. If you’ve made it all the way to the bottom of this wordy post (congratulations! ), you may just be as patient and detail-oriented as I am. But if you’re not comfortable shooting this way, no worries. As you can see, this was a very nice sunset–a quick look at my thumbnails would reveal to some an alarming frame-to-frame similarity. In this case I’m extremely happy to have a large variety of versions of this composition from which to choose, but if I’d have been less than satisfied with my decisions (as sometimes happens), unlike those who moved around that evening, I’d have no alternatives as potential consolation. Truth be told, studying, refining, and becoming intimately familiar with a scene just makes me happy, and if you can’t be happy taking pictures, what’s the point? Gary you’re a great teacher and a great photographer. Now that I’m a California guy I can’t wait to see these places in person! Great post. I never knew what to call myself till now. Frenetic…I will look up the meaning. I still follow all the steps you mentioned, but I defineately like to shoot as many compositions as I can. Then I return to the one I feel had the most value for the final hurrah. Wish I could articulate the way you do. I don’t think I will ever be a teacher. Thanks a lot for your detailed and patient description. Wonderful lesson! Wonderfully presented, Gary! I think I am somewhere in between frenetic and calculating….But no matter….What strikes me so much after reading your post, then going back to the image is the way the arrangement of the poppies mimics the shapes of the clouds. I have no idea if this was done on purpose, but it was a wonderful discovery for me!